Meimei, I gotta say that I am really intrigued by the political situation in your rat cage! I can’t believe that Turnwise and Widdershins tried to stage a coup. I hope poor Alarum is recovering well from this recent assassination attempt. Now, I have been told that fancy rats like Alarum actually make great first pets, as they are gentle, friendly and much easier to handle and care for than smaller rodents such as hamsters or mice. Rats also bond with their owners in the same way that a dog will so that they can be trained to do simple tricks and will even approach their owners to be cuddled. J and Little E are still too young to be responsible for the care of a small ratty critter. In any case, I don’t think we have a suitable place for pets in our home anyway. 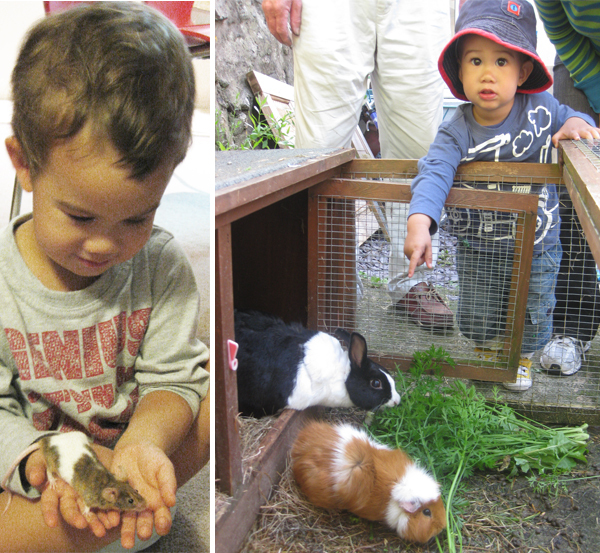 However, this does not stop us from finding opportunities to allow the kids to interact with animals. I think that it is important for the children to learn how to handle and care for little creatures, as it gives them confidence and a sense of responsibility at a young age. It is also great way for to encourage gentleness and kindness. We have been very fortunate to be in contact with people who own kid-friendly pets. J has played with mice (at your house), rabbits and guinea pigs (at my in-laws place), and both he and Little E have been in contact with friendly dogs living in our neighbourhood. At the moment, both J and Little E express a great love for cats – probably because cats are quieter than dogs and appear less intimidating. J’s current ambition in life is to own a marmalade kitten. He has already decided that he will adopt a kitten from a rescue organisation like the SPCA, instead of direct from a breeder. My in-laws have a cat, a timid, nervous little black puss named Poppy. They learned to step quietly and talk softly to Poppy, who long-sufferingly allows them to gently stroke and pet her (she normally shies away from children). It was amazing watching my normally loud and active little girl, quietly whispering to a purring cat. The kids also help to feed the fish at their grandparents’ house (you know our dad just loves goldfish and koi). They even assist Ah Kong in changing the tank water, which is nice and messy fun for them. At school, J helps to feed the rabbits and his classroom even keeps a vivarium with stick insects in it. When we visit the zoo, I try to encourage them to hold and touch reptiles under the supervision of the keepers. I have no idea what I will do if either of them decide that they want to keep a terrarium of snakes or lizards. Or frogs. Probably smile and nod but scream internally. I am really looking forward to the day when we can pick out a pet together as a family – but until then, we shall live vicariously through your rat-keeping!